The next several Disney Odyssey installments are going to come in pairs. That is, it’s a BOGO sale. Or something. This chunk of films are shorter, less plot-heavy, and with plenty of variety in characters and types of tales being told. 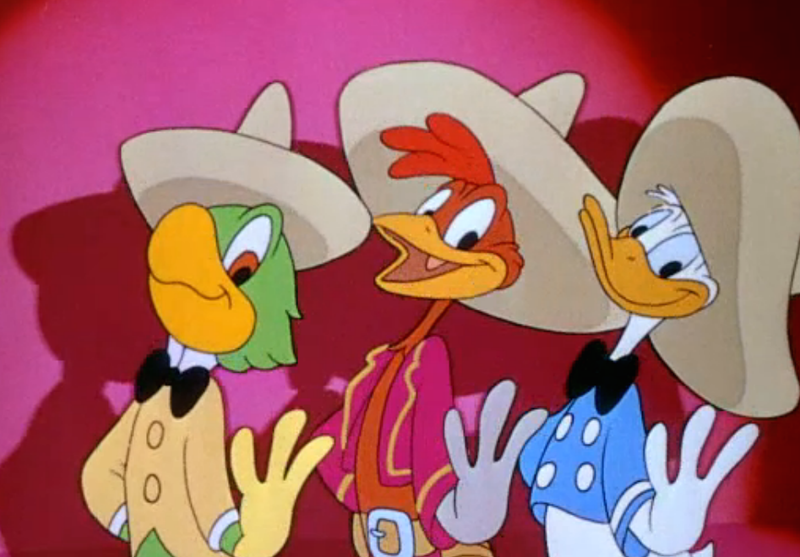 We’re kicking off the 2-For-1 Special with a trip to Latin America with Donald, Goofy, and a buncha crazy birds in Saludos Amigos and its sequel The Three Caballeros! The title of the film means “Hello Friends!” in Spanish. 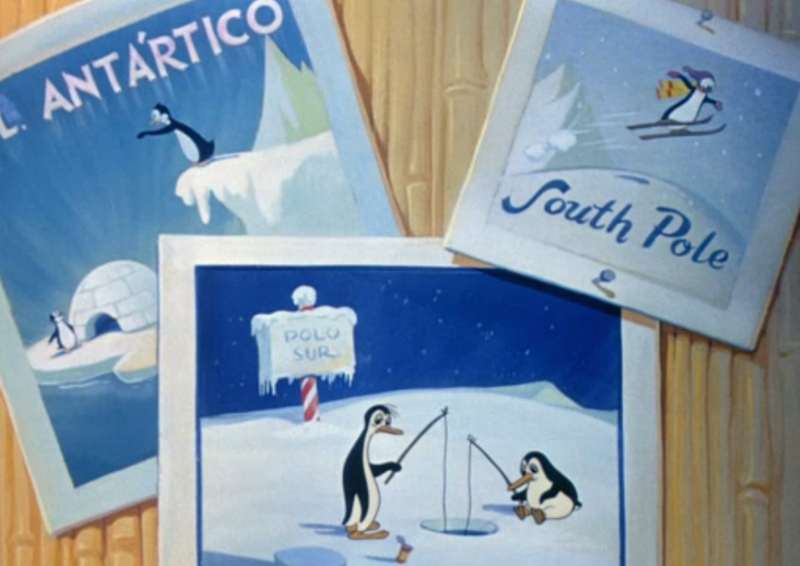 In 1941, the U.S. Department of State commissioned a Disney goodwill tour of South America. Approximately twenty composers, artists, technicians, and so on journeyed to Brazil, Argentina, Peru and Chile. Even Walt himself went along! The whole idea was that the U.S. wanted to strengthen ties with Latin America since there were definitely strong relationships between certain South American countries and Nazi Germany. 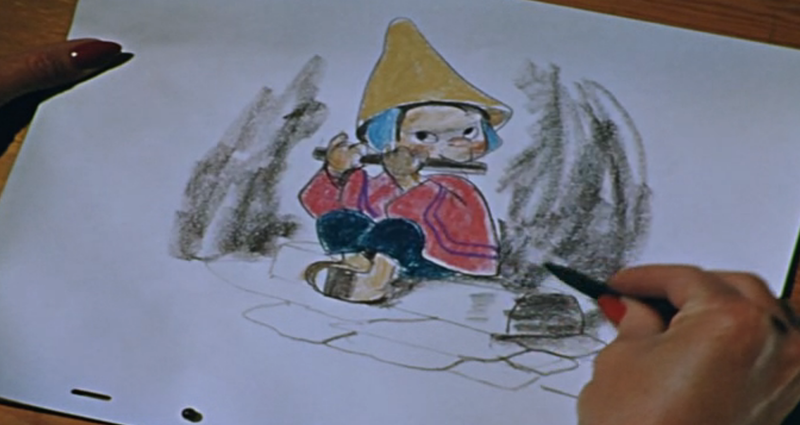 Disney characters were extremely popular, so the U.S. opted for Disney to spearhead the mission. Many contemporary U.S. viewers were stunned by the live-action documentary clips in the film which showed modern skyscrapers and fashionable cities. Prior to then, the general American public considered South American nations to be less modernized. The success of this film helped contribute to changing that impression. It was nominated for three Oscars: Best Musical Score, Best Song, and Best Sound Recording. Ooh, live action documentary segments… this is new for the Disney Odyssey. “But common for that time period,” offers the Fella. 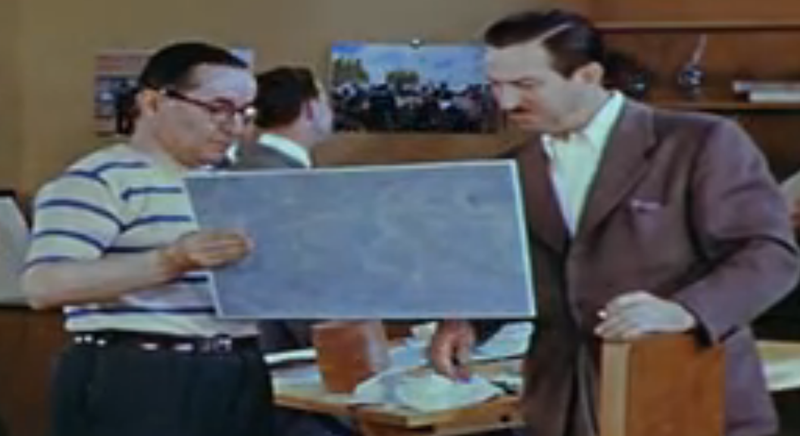 The guy in the tan on the far right… that looks like Walt to me! Ah yes, Lake Titicaca. First made famous here by Disney, later re-immortalized in WB’s Animaniacs cartoon. Among the plentiful male artists and animators they’ve shown, we have our first sighting of lovely manicured hands sketching for this feature! Huzzah! Llamas! 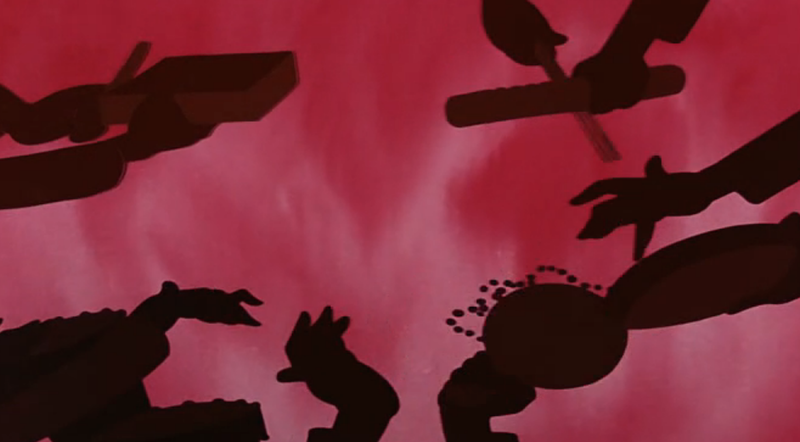 First made famous here, later re-immortalized in Disney’s The Emperor’s New Groove! 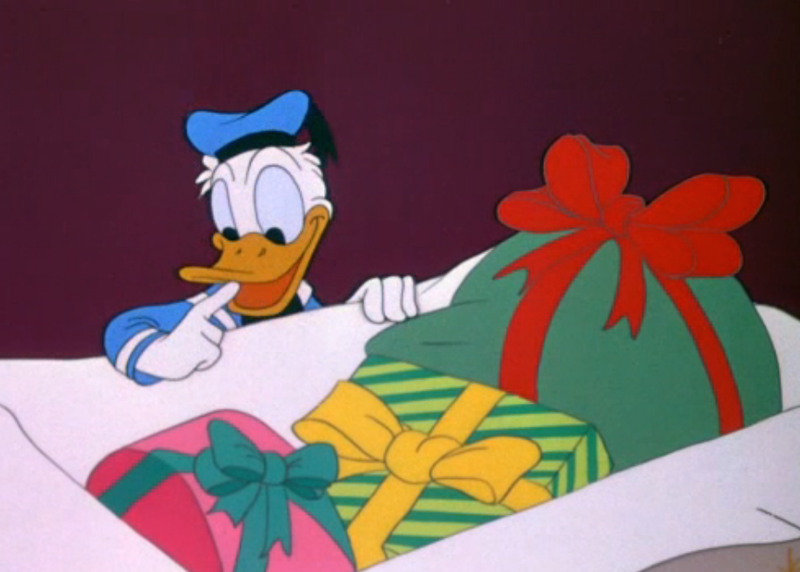 The Lake Titicaca sequence of this film is the first major motion picture debut for Donald Duck. 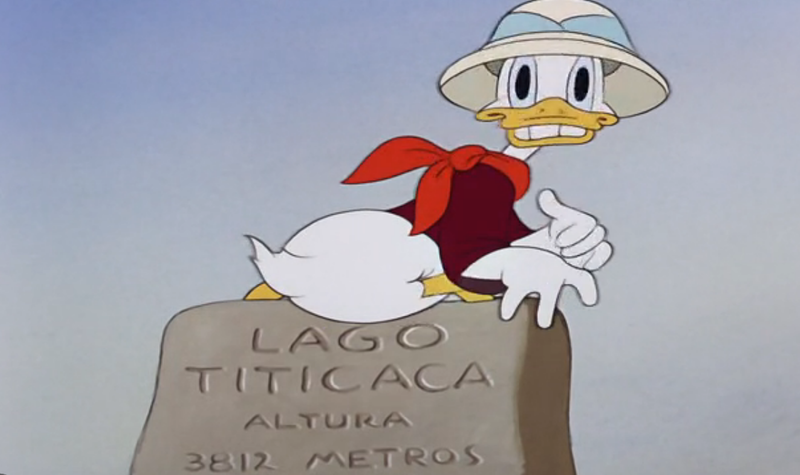 He was already extremely popular as a character, especially in Latin America, and so the animators used him as an example to provide comedy as well as tourism. This whole chunk is commedia gold. This is straight up cartoon slapstick, no seasonings, no sauce, just plain old-fashioned animation insanity. 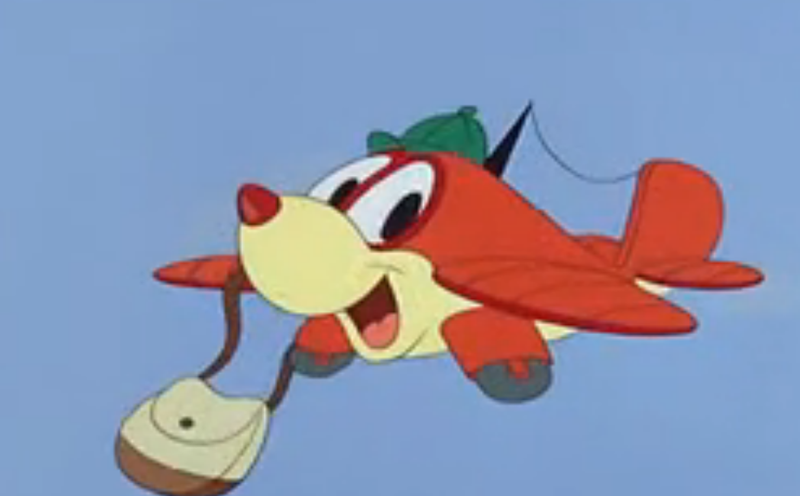 Pedro the Plane… perhaps a forerunner to “Cars” and “Planes“? Pedro the baby plane brings home the mail! Wait. 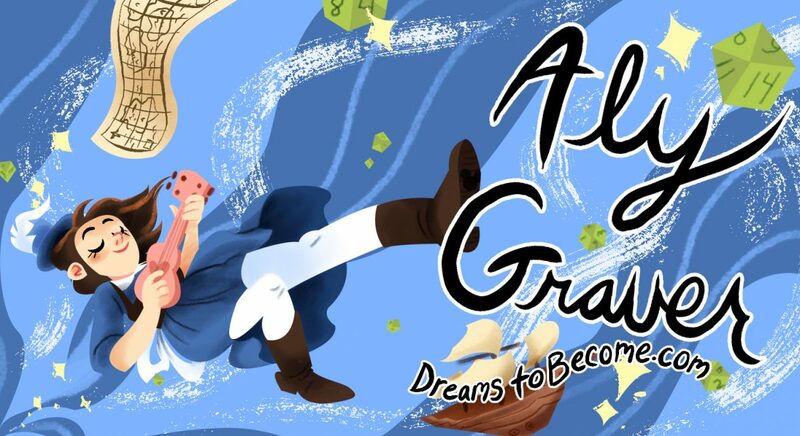 Is the antagonist of this story a… a mountain peak? 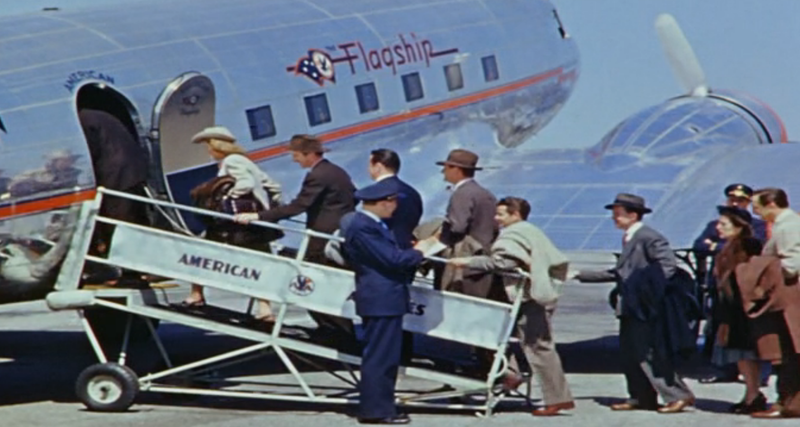 More lovely documentary clips… you know that contemporary audiences were probably completely shocked to see all these things in South America, which they probably thought was all grasslands and jungle and mountains and no skyscrapers or high heels whatsoever. Goofy…is a cowboy? 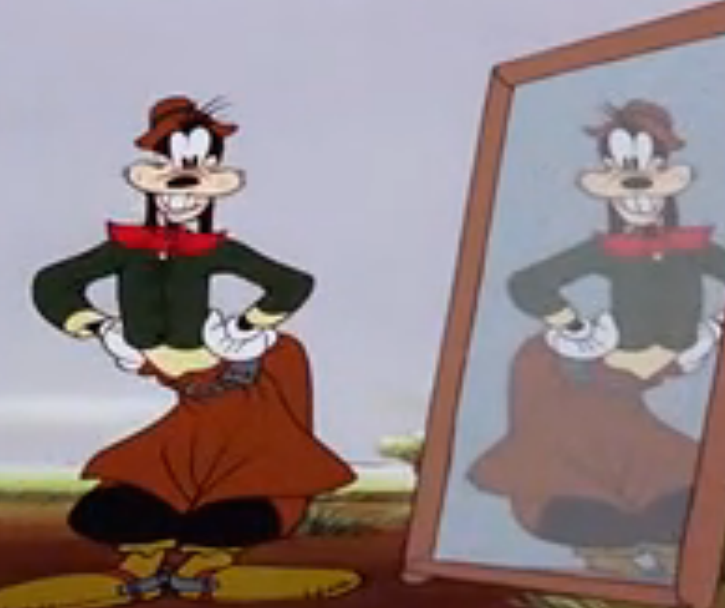 Was Goofy always a cowboy? I thought he was just… y’know. A Goof. A dog-Goof. Maybe this is just a elaborate ruse to ease us into being educated about gauchos. More commedia gold! His horse is pretty dang funny. And the dance sequences are great. In the brief live-action clips of Rio de Janiero, we hear a vocal acknowledgement of “the Savior” – referring to the statue in Rio of Christ the Redeemer. Significantly, this is the first open mention of Christianity in a Disney animated feature film so far. Characters have prayed in the previous films, but there have been no mentions of God or Jesus or any other religions or deities. Innnnteresting. The Aquarelo do Brasil segment is clearly riding on the fumes from Fantasia – it’s semi-abstract and full of color and music. It captures the feel of Brazilian samba music in a way that definitely feels reminiscent of Fantasia. And here we have the first appearance of Brazilian parrot, Jose Carioca!!! With absolutely no subtitles, thankyouverymuch. So chic, so metropolitan, so fancy! Let the record show that this song has been stuck in our heads for like, TWO WEEKS now. The parrot Jose Carioca obviously embodies Brazil, the rooster Panchito Pistoles represents Mexico, and Donald Duck is America. At EPCOT in Walt Disney World, the Mexico pavilion in the World Showcase is home to a boat ride starring the Three Caballeros. You can also meet Jose and Panchito there occasionally, but most commonly found is Donald wearing a Sombrero and a serape. 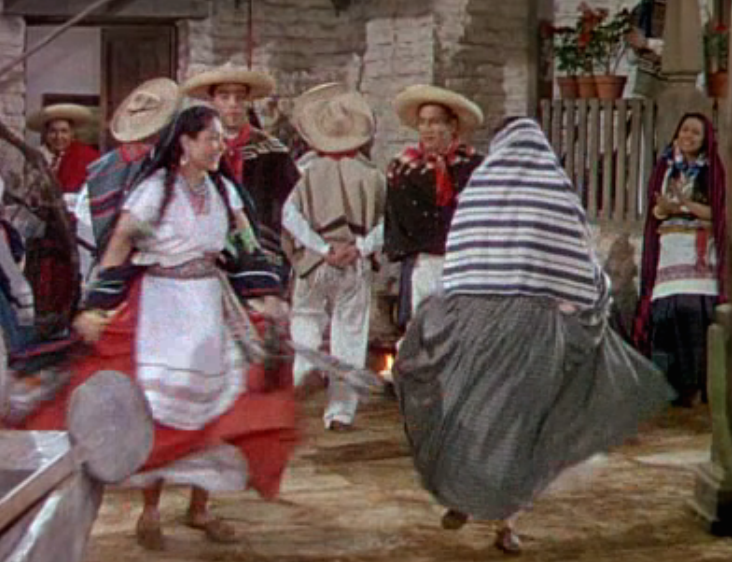 The film features cameos of Aurora Miranda, Dora Luz, and Carmen Molina. Most songs featured in the movie are by popular Brazilian composer and musician Ary Barroso, but many feature new or adjusted English lyrics. The film received two Oscar nominations: Best Musical Score and Best Sound Recording. 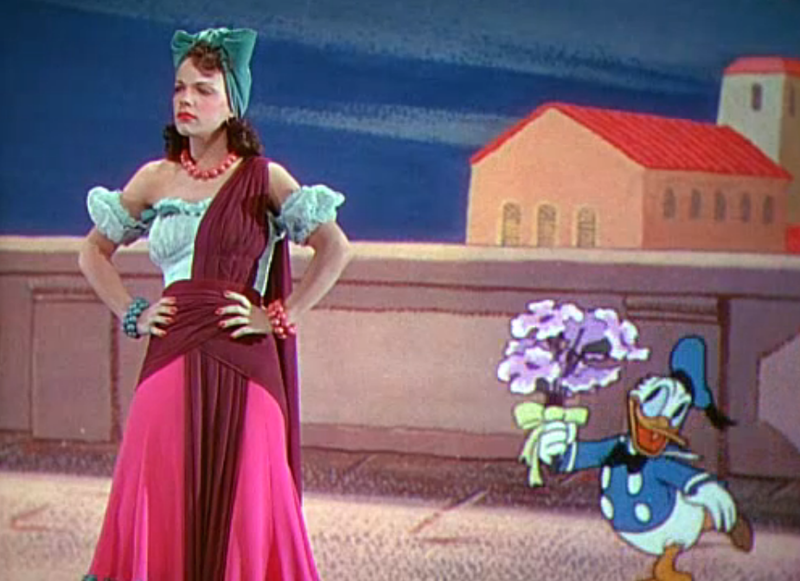 Some critics found it to be too flashy, while others questioned its content – specifically the apparent sexual attraction of Donald to various South American women. 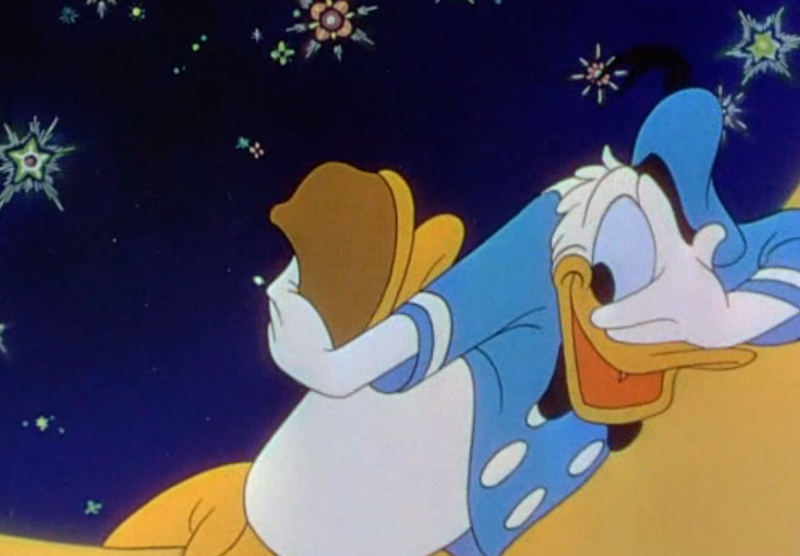 Donald Duck’s birthday is Friday the 13th? That… explains a lot, actually. Aww, ye olde home movies from Donald’s South American buddies! Ohhh, that voice! 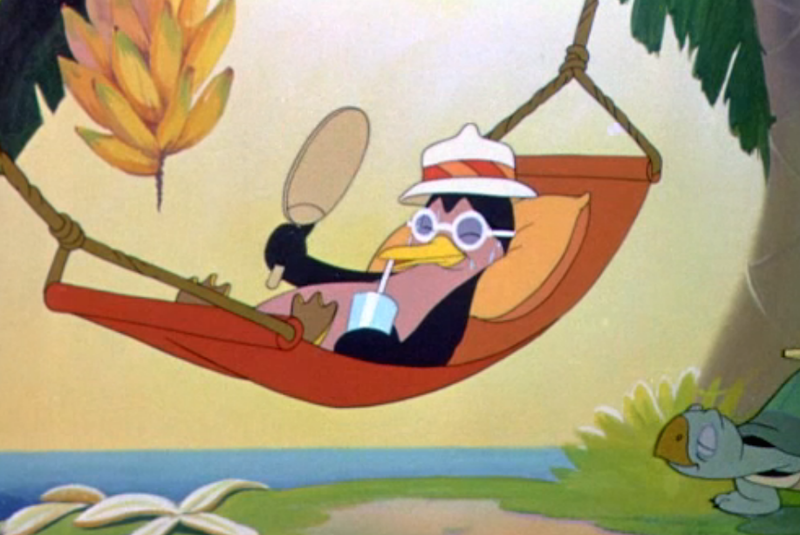 The narrator for “The Cold Blooded Penguin”…. Ladies and gentlemen: Sterling Holloway. He’s in practically everything and his voice is like magic velvet. Pablo the penguin’s story is a story much like all of ours… He is in many ways an analogue for every Chicagoan ever. We live here, we should be totally adjusted to the cold, but we definitely aren’t. Winter is horrible every single year and we can’t get comfortable. It’s a tragedy. Pablo needs some more North Face jackets and Ugg boots. Haaaha, I love that his neighbors couldn’t care less about him trying to leave. It’s kind of hilarious. Aw, he made it to paradise! But… seriously? Yes. He misses the cold. This IS an analogue for Chicagoans. We’re like “Where’s summer?? ?” and then it gets here and we’re all melting and falling apart because it’s too hot. Dang. I got really excited when he said he was hunting thunderbirds…but then… OMG. 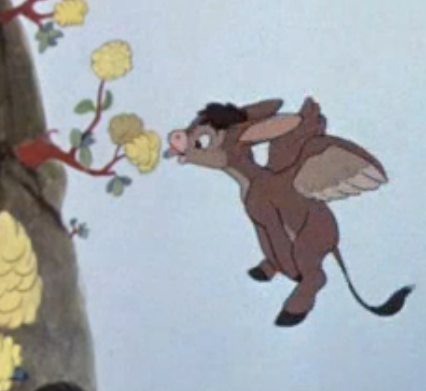 Donkey-bird! 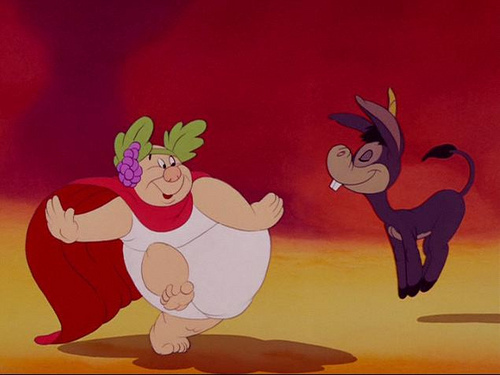 Is it related to Dionysus’ donkeycorn in Fantasia??? Wait, since when is this section suddenly in rhyming couplets? It wasn’t to begin with, was it? This insane bird… why is he wearing a hockey shirt? and why is he pulling a Harold and the Purple Crayon here with the train tracks?? The only answer is that he must be an agent of chaos. Ooooh, some live action AND animation at the same time! Not too shabby for this time period. This gal Yaya is fiiiiickle. She wants to dance with everyone! 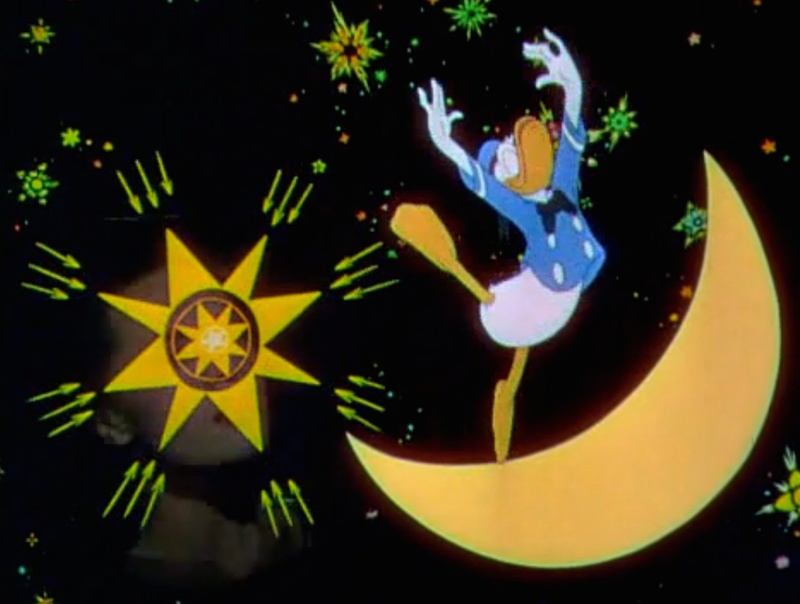 There are some neat little cartoon/cinematic tricks in here, with Yaya kissing Donald, the two male dancers turning into a cockfight and back to live action again… pretty smooth, considering how old this is! Did they just use the terms ‘midget’ and ‘black magic’ in two consecutive sentences? Hmmm. And here comes Mexico! OH LOOK! It’s the Soundtrack from Fantasia!!! Oh, yes, of course, a magic serape…. 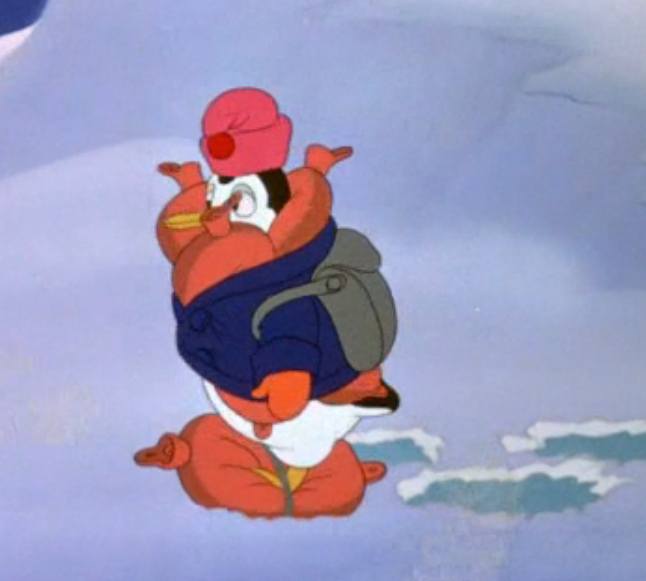 foreshadowing to Aladdin’s magic carpet! Donald! Reel it in, there, buddy! Bathing suits do not equal consent!!! 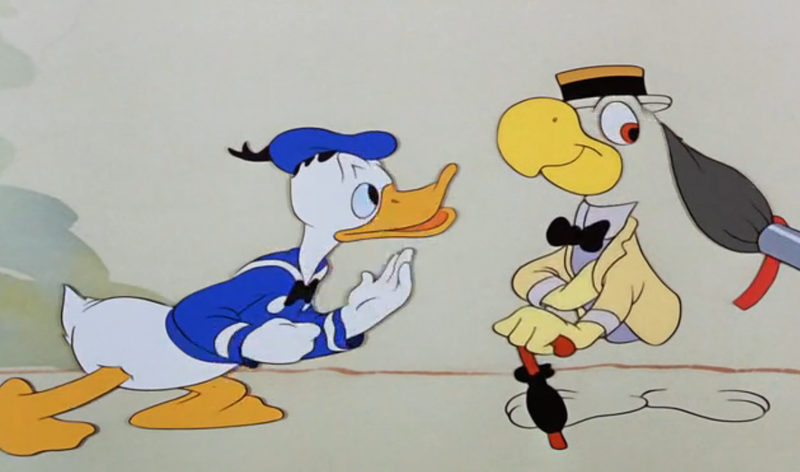 So this movie is really about Jose and Panchito trying to stop Donald from hooking up with various local ladies. What a lovely arabesque, Donald! What….is happening….here? Did they just decide to blow the rest of the budget on a love-drunk dream sequence with music, dancing, and transfiguration? Oh man! Commedia Bonus: 15! Lots of good commedia fighting and surprising in this one. After watching both films, the Fella and I had a somewhat lengthy discussion about the American melting pot bias. This is what I call the concept that Americans love other cultures and heritages because we as a nation “do not have one.” We do, of course, have a heritage and a culture, but because our nation has the unique situation of being built out of people from many countries and other cultures we have this ‘melting pot’ or patchwork society. So other nations with strong identities or cultures are fascinating to us. It’s like how everyone loves to say how Irish or German or Polish or Swedish they are, but the truth is we are all Americans first. Unless we were born and raised in another culture/country, which is different, of course. Next up: Make Mine Music!